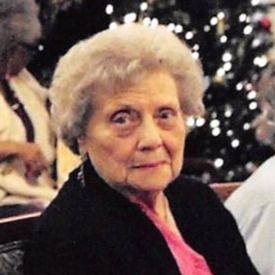 Vera Mae Schmitz, 93, Kansas City, KS, passed away March 16. Visitation will be held on Tuesday, March 19, from 5 - 7 p.m. at the Porter Funeral Home, 1835 Minnesota Ave. Kansas City, KS. Funeral Services will be held at 11:30 a.m. on Wednesday, at the Funeral Home. Entombment will follow at Mt. Calvary Mausoleum. Vera is survived by her children, Michael (Carol) Schmitz, Pamela (Robert) Brittingham, and Dan (Teri) Schmitz, 1 sister, Annie Isabell, 8 grandchildren, 24 great grandchildren, 2 great great grandchildren and 1 god daughter, Mary Kay Traffis and numerous nieces and nephews. She was preceded in death by her husband Leo, infant daughter, Caryl Louisa and daughter, Patricia Kathleen. In lieu of flowers please consider donations to Encompass Hospice, 14833 W. 95th St. Lenexa, KS 66215. I am so, sorry to hear of your loss! Know that you are in my thoughts and prayers in your time of grief!